A global issue like Xylella fastidiosa requires joint actions between the actors involved. Therefore, a continuous exchange of knowledge between scientists and European policymakers brings added value, and it helps draft legislation that take into account the latest scientific findings. 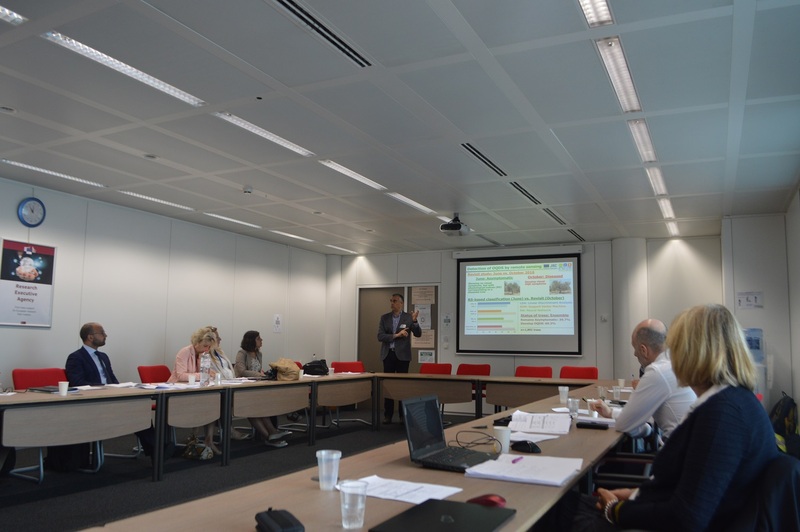 In this direction, last 30th of June a policy meeting has been held at the REA (Research Executive Agency) headquarters in Brussels, between representatives of XF-ACTORS and POnTE projects and European Commission officers from the DGs interested by the topic of Xylella fastidiosa (DG SANTE, DG RTD and DG AGRI). The two projects, funded under the H2020 programme, are composed by international consortia made up of research centers and organizations from all over the world, with the aim to develop research with a multidisciplinary approach on Xylella fastidiosa and other emerging pests threatening EU agriculture and forestry. XF-ACTORS started in November 2016 and POnTE project started in November 2015. Both projects have received funding for four years. The meeting was an important opportunity for the representatives of XF-ACTORS and POnTE projects to describe the scientific achievements obtained so far. In particular, Maria Saponari (coordinator of XF-ACTORS) and Donato Boscia (coordinator of POnTE), from the Institute for Sustainable Plant Protection (CNR-IPSP), described the many aspects on which the research on Xylella fastidiosa is focused: studies on the aetiology of the Olive Quick Decline Syndrome; isolation of the bacterium, biology and pathogenicity studies; genotyping and genetic variability; development of early detection and surveillance programs; extended knowledge on the vector’s biology, ecology and role in the disease; epidemiology and host pathogen interactions; integration of research data on Xylella fastidiosa and implementation of pest risk assessment; strategies for management and containment aimed at reducing the economic, environmental and social impacts. Among the different research topics discussed, Dr. Pablo Zarco-Tejada, a Researcher currently working at the Joint Research Centre (JRC), European Commission, illustrated the first year results of flight and field campaigns, conducted by POnTE and XF-ACTORS members in collaboration with JRC, which allowed to gain preliminary evidence on the possibility of using plant physiological indicators for the early detection of the Xf symptoms (pre-visual) through remote sensing approaches. The campaign is currently being conducted for the second time in the Apulia region, with an airplane equipped with thermal and hyperspectral imaging sensors, and a group of scientists from CNR (Italy) and IAS-CSIC (Spain) carrying out field evaluations of individual trees for calibration and validation of the remote sensing methods. As underlined by the officers of DG SANTE, scientific achievements are paramount to design actions that prevent further introduction of Xylella fastidiosa in Europe, to monitor intensively the territory of the European Union so as to ensure early detection and eradicate any new outbreak that could occur, other than help find solutions for the territories where the bacterium is widely spread. A session of questions and answers followed the meeting, engaging the participants in a fruitful discussion that helped expand and specify several aspects of the projects’ outcomes. The meeting ended with the proposal to hold it again next year, as an important opportunity to establish relations and exchange knowledge finalized at solving a critical disease for the future of EU agriculture.